Explore the creative possibilities of working in a series by making one of your own. Participants bring a small piece to the workshop from which to build a series of two or three additional works. We will first evaluate all pieces made in advance and discuss their potential for development into a series. Participants then form a plan of their own considering color, composition, and elements of design, such as contrasts of size, contrast of temperature, contrast of values, engaging the edge, negative space, etc. Each piece in your series builds on the previous one. 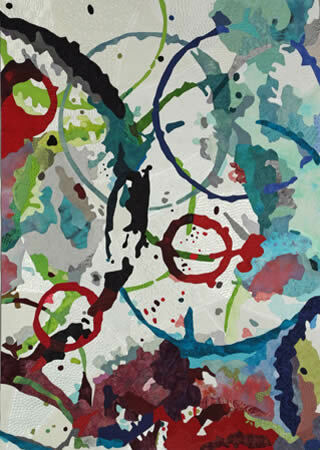 Abstract watercolor paintings will be created the first day using 10 different painting techniques that will leave the student with several paintings to work from. 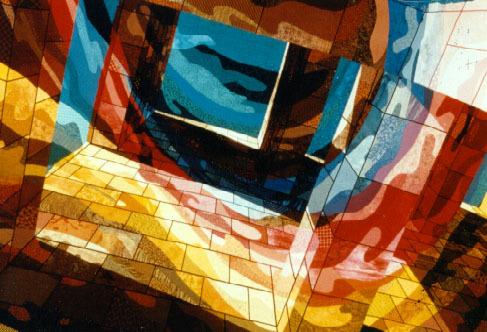 Techniques include, transparent layered shapes, tape resists, rubber cement drawing resist, washes, glazing, dropping in of colors, surface treatments using soap bubbles, rubbing alcohol and grids, etc. One painting will be chosen and cropped to find the most dynamic part. This will be drawn to make templates, then enlarged, and translated with fabrics into a quilt using either my turned edge technique or the students preferred technique. 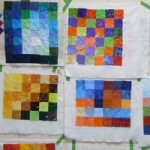 When the quilt is done it will look like a watercolor painting. No painting experience is needed. 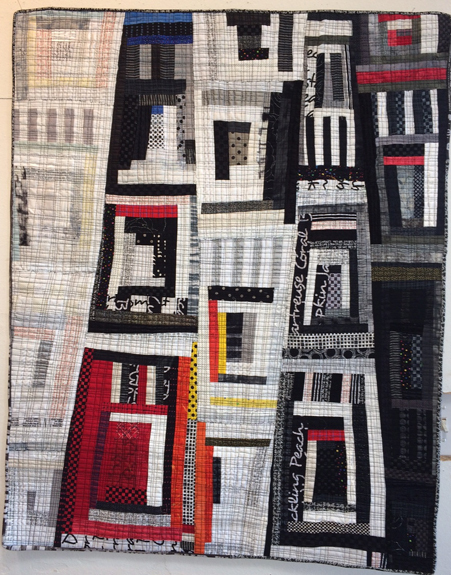 The log cabin block is so very versatile, we will use that as the basis for creating linear abstract art quilts. Start with a painting or photograph, crop that to a strong personal composition, overlay a grid, this can be an even grid, an uneven grid, curved or random grid, this linear drawing is laid over the inspiration photo or painting to become the map. 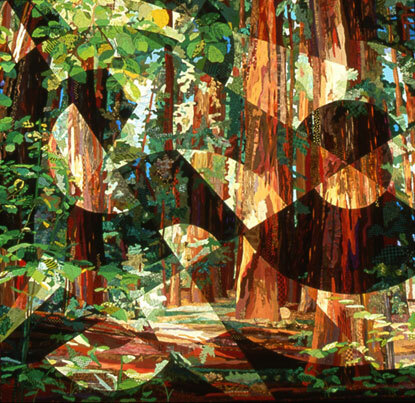 Then log cabins made up of the colors found in each unit of the grid will be constructed and then put together to make the quilt. 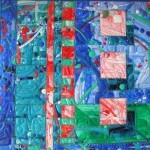 Emphasis on composition, variety, color, value and visual pathways. 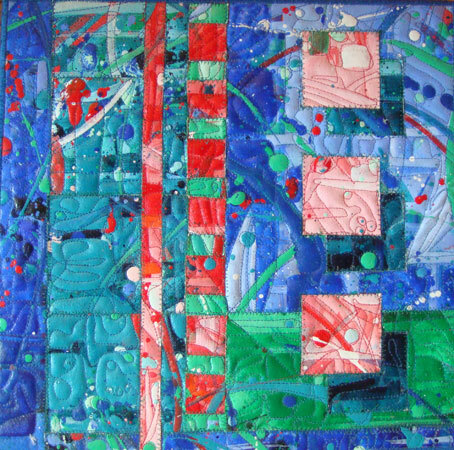 This class combines painting and quilting. Using Acrylic paint the students will create layers of imagery onto thin canvas, applying fused fabrics and many layers of thin fluid acrylic paint. 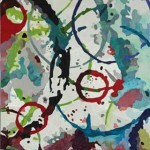 A color scheme is chosen and two to three canvases are painted within that color scheme. 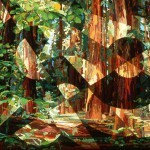 Then these canvases are cut apart and combined to create a complex composition. The reconstructed canvas is then layered with batting and backing and stitched. 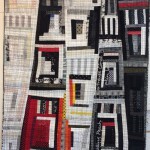 These stitched pieces can then be stretched on a frame ready to hang or inserted into a quilt of the same design to create a many textured creation. This workshop will show you how to start with an original photograph, line drawing or painting and create a departure from its reality. We will do 6 + different exercises to explore the abstract and non-representational designs, these include, shape, line, blind painting, cubing , zooming, abstract still life. 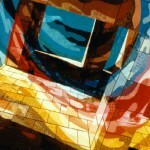 Composition, color schemes and a well thought out plan will be emphasized. A quilt design will be fully realized. 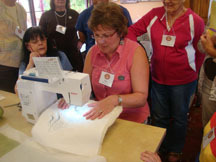 Many different techniques will be discussed to help you create your quilt such as appliqu, piecing, fusing, collage, and painting and stamping on the surface. Color and texture, warm and cool, reflective and absorbing, all the properties and moods of color in fabric will be explored using actual fabric swatches to design a color wheel and color study wall hanging. Learn to use color more freely, following what looks right to you, not what the text tell you should be. A more emotional way to work with color. The color swatches consist of all types of fabrics, from cottons and blends. To satins and lam, everything! 1 day class, 6 hours. Each student will bring fabrics from home to combine with each others, to create a color wheel and several studies. 1. A photograph is used for the base design. 2. Add a Ghost layer or floating design, (transparency) complimentary or in opposition to the first layer. These three layers combined will create an in-depth and illusionary design. A small quilt sample will be created the first day and then a larger masterpiece will be started for the balance of the class. Create a beautiful landscape using a photo of a special place. Find your personal, stylized version of reality. Fracture the finished drawing to create different shapes for color choices and add a surrealistic quality. Work with a stabilizer or foundation, blind machine applique, machine satin/straight quilting in a quilt-as-you-go format. Easy techniques that create a complex looking landscape.